It’s my darling’s birthday today and I thought I’d make him a special treat since his birthday is also so close to Valentine’s Day. 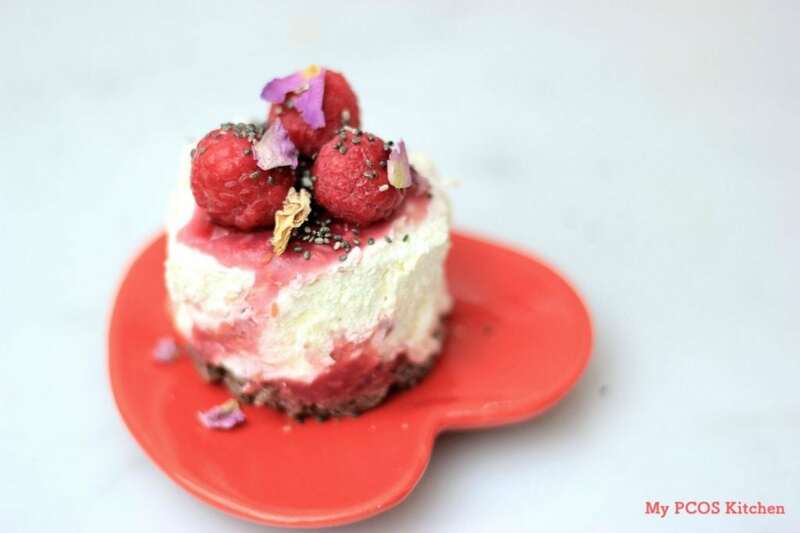 I’ve been wanting to make cheesecake for a while and he loves it when I buy raspberries so I decided the two of them and make this super yummy Keto Raspberry No-Bake Cheesecake! I think the most common and popular cheesecakes in Japan are no-bake cheesecakes. They can be made using different types of milk products, including yogurt, sour cream, soy milk, cream and cheese. I decided to use cream cheese and cream to make it simple, but added gelatin to it to make it dense and so that it holds together firmly! 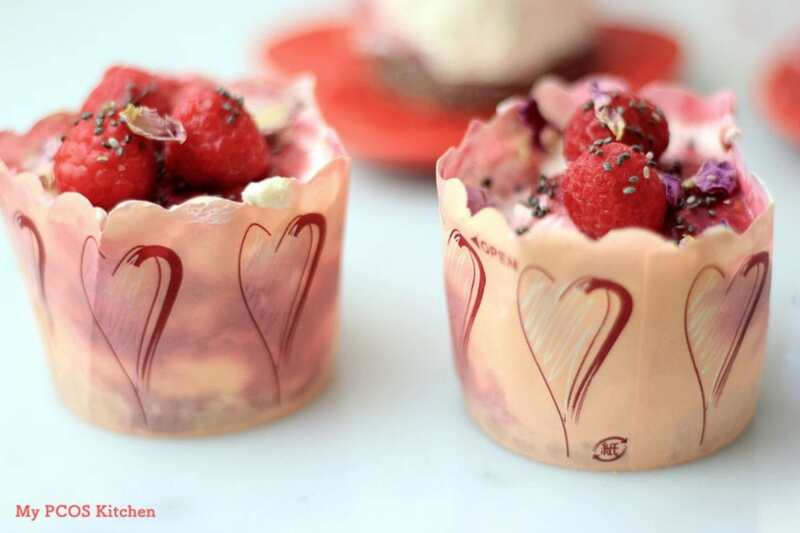 I first made this recipe in a normal cheesecake mold, but thought it would be better and cuter if they’d come individually prepared in a cute cupcake liner. 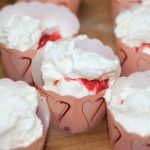 I found these super adorable parchment paper based cupcake liners at the dollar store and decided to make mini cheesecakes using these! Once the cakes had cooled, I simply needed to peel the paper out and the cheesecake was ready to eat! Making nine mini cheesecakes is definitely better than a gigantic one because it helps keep the portions under control. 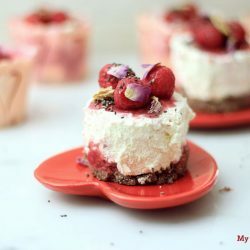 I decided to decorate the cheesecakes with a few raspberries, chia seeds and dehydrated rose petals, but you are free to decorate them as you wish! 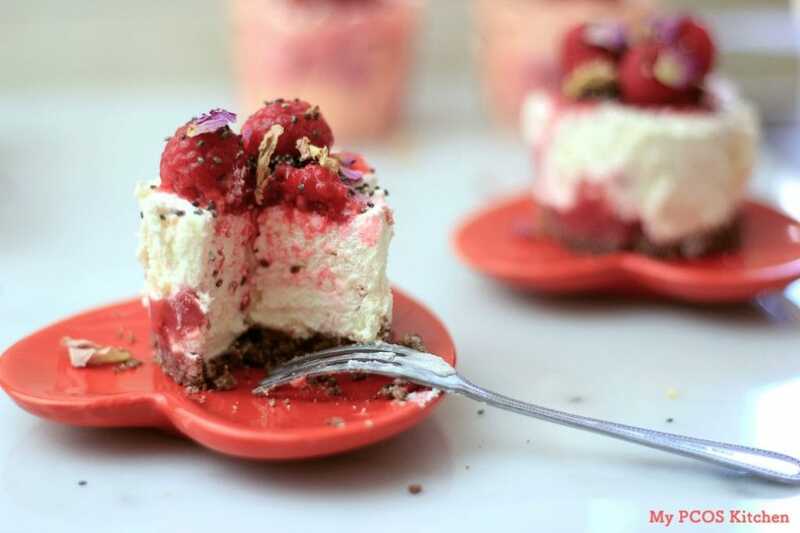 I decided to put some gelatin inside the pureed raspberries too because I wanted them to have a jelly texture, but I’m sure you could just pour them in the cheesecake batter and it would hold up nicely because the cheesecake has some gelatin in it. 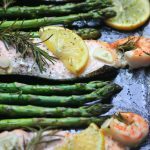 If you’re looking for a healthy snack to make with your kids, or to make for yourself or for some friends, look no further! This is it! Mix the 60ml of boiling water with the 7g of gelatin powder in a small bowl for the raspberry jelly. 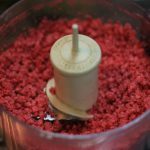 Place the raspberries in a food processor and pulse for 10-20 seconds, just until broken up. 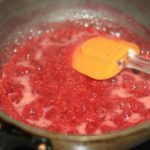 Place the raspberries in a small non-stick pot along with the lemon juice, and stevia powder. 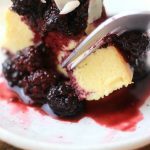 Start simmering on low heat while mixing the berries and breaking them apart. Pour in the gelatin and cook for 2-3 minutes, just until the sauce starts to thicken. Turn off the heat and put it aside to cool. In a bowl, mix the chocolate crust ingredients together until crumbly. 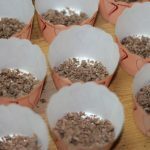 Spoon the crust ingredients in 9 different cupcake liners and flatten the bottom with a spoon to make a crust. 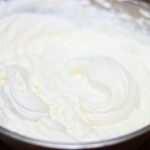 In a different large bowl, mix the heavy whipping cream with a hand mixer until stiff peaks form. 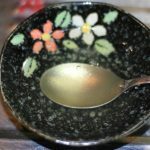 Mix together the 60ml of boiling water with the 7g gelatin in a small bowl for the cheesecake. In another bowl, add the cream cheese, stevia powder and vanilla. Mix for 30 seconds just until incorporated. Pour in the gelatin mix and continue mixing for 20-30 seconds. 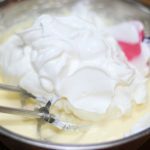 Add the heavy whipping cream and continue mixing until all of the batter has been incorporated together and evenly mixed. 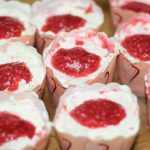 Spoon half of the cheesecake batter into each cupcake liners, and cover with half of the raspberry jelly. Spoon the other half of the batter over the raspberry jelly and with a spoon/fork/chopstick, mix the cheesecake and jelly mixture inside the cupcake liners. 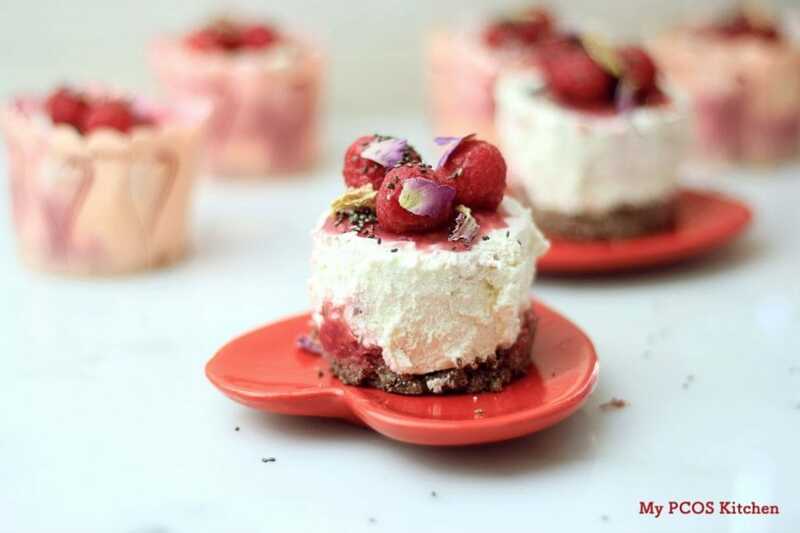 Flatten the cheesecake as best as you can with the back of the spoon and spoon the remaining half of the raspberry jelly over each mini cheesecake. 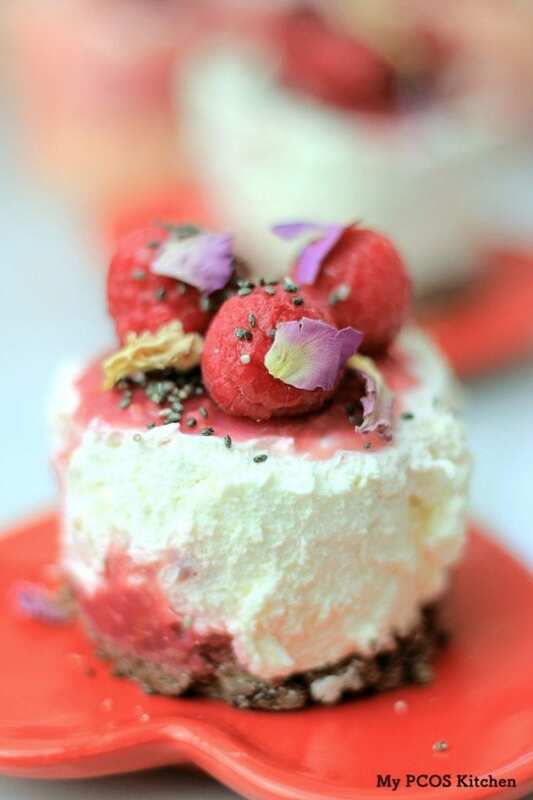 Feel free to top the cheesecakes with whatever ingredients you want. 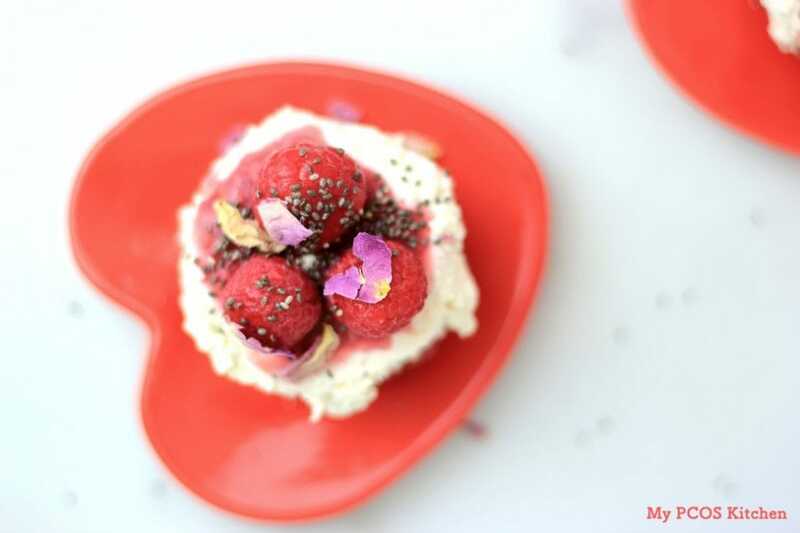 I topped them with some raspberries, chia seeds and rose petals. Feel free to use any type of berries you want! 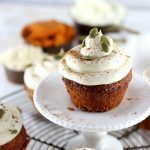 What can be a almond flour alternative that is gluten free? You can use any other nut flours, coconut flour or seed flowers like pumpkin/sunflower, etc!